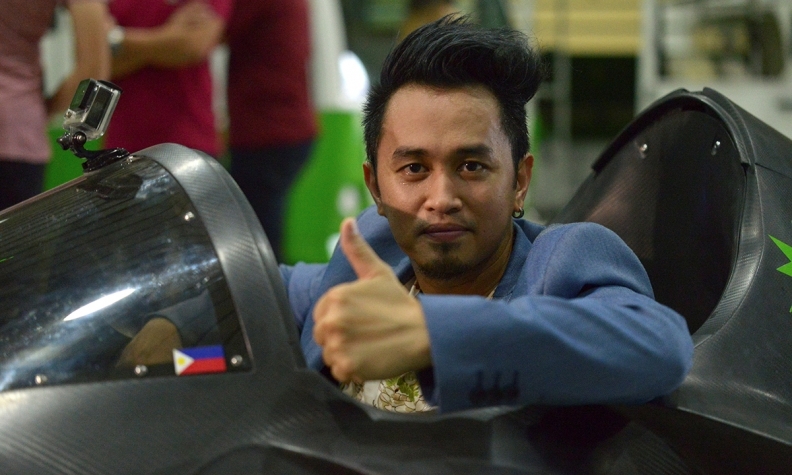 Filipino inventor Kyxz Mendiola tests his flying car in the Philippines. The "Koncepto Milenya" can fly as high as 20 feet and speed up to 37 mph. 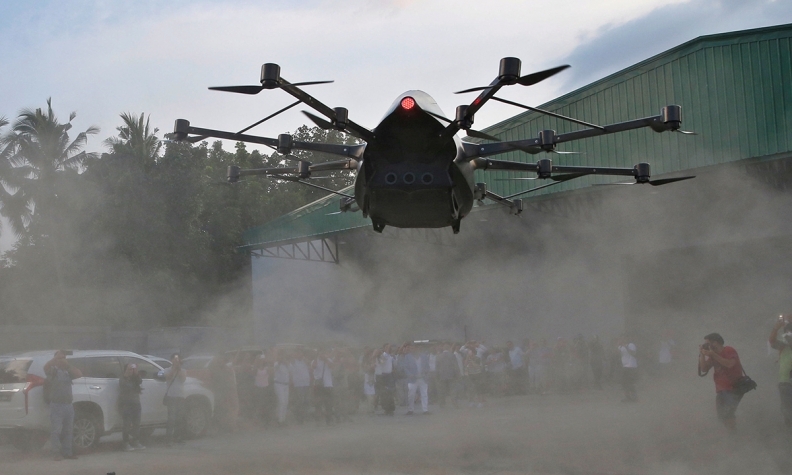 BATANGAS, Philippines -- A Philippine inventor has unveiled what he calls a flying sports car that represents the future of transport, riding it out of a warehouse towards a cheering crowd, leaving a cloud of dust in his wake. Former dancer and camera operator Kyxz Mendiola flew and hovered for a few minutes in a single-passenger contraption powered by the "multicopter" technology commonly used in small unmanned drones. "It was amazing," Mendiola told Reuters after what he said was the first public test flight of his invention. "All the hard work paid off. Everything worked perfect." Mendiola's machine, the "Koncepto Milenya," can fly as high as 20 feet and speed up to 37 mph, but its maiden flight lasted just a little over 10 minutes. He said it took a long time to save up the funds for the components of the single-seater powered by six lithium ion batteries whose passenger steers with a portable radio frequency controller. "Press a button and it will go up, then push the stick forward, it goes forward. It's very smart, that's why I'm saying it has a lot of potential," Mendiola said. The machine, which can carry up to 220 pounds, could shave hours off trips in cities like the capital, Manila, crippled by chronic traffic problem, Mendiola felt. Kyxz Mendiola: "All the hard work paid off. Everything worked perfect." "When we have to go somewhere about an hour's drive, this can take you there in five minutes," he said. An added safety feature is that the craft's 16 rotary motors allow it to keep flying, even if one or two fail, he added. An Australian company, Star8, is partnering with Mendiola to develop the vehicle after a video featuring it went viral on social media. Star8's CEO Jacob Maimon said he wanted to mass produce it and market it in Australia, Europe and Hong Kong, after helping Mendiola perfect the machine. "We will get there very fast now, what with the help that we can give him," he added.